The notion that musical training can have positive effects on cognitive functions other than music has long been a source of interest. Research first emerged at the beginning of the 20th century. Standardised assessments of IQ and musical ability suggested the two were correlated – and it was thought that participation in musical training could improve IQ. Recently, research has shifted focus from effects on musical training on global intelligence and instead focuses on benefits to specific skills and tasks in individuals. Musical training has shown to lead to improvements in a wide variety of different skills, including memory and spatial learning for example. In addition, language skills such as verbal memory, literacy and verbal intelligence have been shown to strongly benefit from musical training. Musicians are also more adept at processing speech in environments where there are large amounts of background noise, possess a greater propensity for processing auditory signals that are in some way degradedand show an advantage over their musically naive counterparts when it comes to pitch detection in both music and language. Recent advances in technologies have also allowed researchers to probe into the neural (functional, structural and electrophysiological) underpinnings of these adaptations. A new study, just published in the Proceedings of the National Academy of Sciences, aimed to assess neurodevelopment in adolescence and the impact that certain forms of experience, such as musical training, could have on this process. Neuro-physiological methods were adopted to measure subcortical and cortical responses to speech in the brains of two groups of adolescents in a high school in the Chicago area. One group took part in group musical training and one group took part in a Junior Reserve Officer Training Corps programme. Enrollment on to one of these two programs was part of the curriculum of the schools with which the lead researcher, Adam Tierney of Northwestern University, worked. The method allowed Tierney and his colleagues to assess how their participants’ brains encoded speech before and after three years of taking part in the two different types of training. Language skills were also assessed using a phonological awareness task – which included asking the adolescents to create a new word by dropping a syllable or unit of sound from a spoken word. They were also assessed using a phonological memory task, in which they had to repeat back lists of digits or non-English words, and a rapid naming task, where they had to read aloud a list of letters or digits as quickly and accurately as they could. At adolescence the brain is not fully developed and specific areas are yet to mature, which makes this an interesting age to do these tests. The results showed that both groups made improvements in all of the language tasks, as would be expected over this period in their development – but, in addition, the degree of improvement was larger in the phonological awareness task for the group who had undergone musical training. The methods used allowed the researchers to track the level of neural development present in the brains of the participants. Through this they were then able to measure the usual time course of changes that occurred at this stage in development and assess any alterations due to participation in either the music training, or officer training. The researchers observed the normal brain development that occurs at this age in both groups. However, for those who participated in musical training the period of time during which regions of the brain responsible for auditory processing were developing was extended in comparison to those that did the officer training. The musically trained groups also showed an accelerated time course for reaching adult cortical development. The results therefore suggest that participation in musical training can accelerate brain development and that this can benefit literacy skills. Music could potentially function as a training ground for language skills and may potentially offer an effective, economical and enjoyable activity that could help improve language skills in children around the world if employed in schools. Giving adolescents musical training could help kick-start and accelerate maturation of their brains. These advantages may also have potential to provide enhancements to a wider range of skills, such as the learning of a second language. The study suggests that musical training could help prolong the window of time in which the brain is developing and is able to deal with complex auditory input, which in turn could make second language learning more achievable to people who otherwise may struggle. It is important to note however, that although musical training was shown to produce benefits for the phonological awareness language tasks, for the other two tests of phonological memory and rapid naming, no difference between the two groups of adolescents was found. This suggests that although musical training does have the potential to enhance some forms of language skills, there are areas that it does not improve. 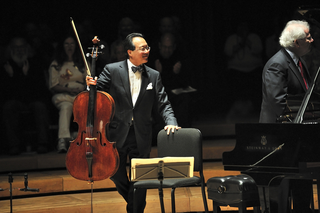 Top photo of Yo Yo Ma via Shutterstock.